South African farm workers need your help! 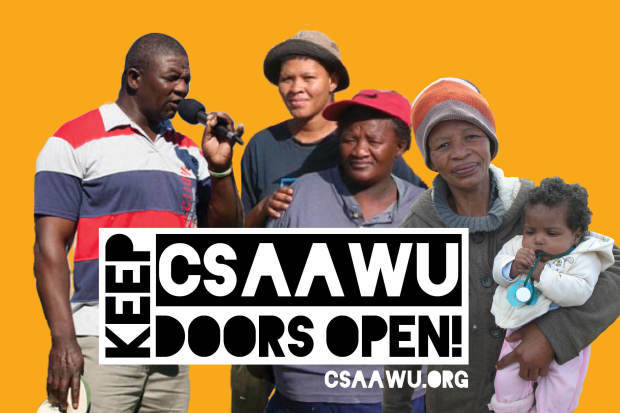 The CSAAWU is the only thing standing between these workers and ruthless exploitation, they need and deserve the support of every worker throughout the world, please contribute to their fund, share their appeal and publicise their situation. They are not so far away, you’ve probably eaten something they grew, picked or shipped. Our class, our future. In the coming months CSAAWU may be forced to close its doors. CSAAWU made a decision to defend all farmworkers who were dismissed or victimized in the aftermath of the 2012/3 farmworker rebellion. Amongst CSAAWU members alone, there were close to 100 dismissal cases. CSAAWU went as far as to take dismissal cases to the Labour Court, representing farmworkers in the Court for the first time since since 1994. The Labour Court issued devastating judgments against the dismissed workers and CSAAWU. The judgment rebuked individual union officials for supporting the strike, deeming this reckless and irresponsible behavior. Cost orders were awarded against the union with the loss of two cases. While CSAAWU paid a high price for its position to support the struggle of farmworkers, we believe that it can never be wrong for a union to support the strike action workers, especially the most vulnerable workers, when they stand up against their exploitative conditions. It would be a devastating defeat for CSAAWU members and farmworkers in South Africa for many years to come if CSAAWU can’t be saved! However, once we pay off the cost orders, we will be stronger than ever! Please read more about the struggles of farmworkers in the Western Cape, and consider contributing to our cause. In 2012/2013, farm workers and dwellers undertook a historic rebellion. It was more than a labour dispute for higher wages – it was a spontaneous rural rebellion driven by workers and communities against the brutal conditions the rural working class are forced to suffer everyday, even 20 years after so-called democracy. The ANC government has failed to transform the rural landscape characterised by dependency master-slave relations, racism, sexism, starvation wages and violations of the limited freedoms won from decades of working class struggle. Farmworkers are forced to work under unsafe and unhealthy conditions, to drink dirty water, live without electricity, live without toilet facilities, on poverty wages, suffer threats of evictions, and violent physical and verbal abuse and intimidation for enacting limited freedoms such as joining a trade union. 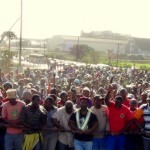 Settlement in Swazi sugar strike brings important gains for workers. The three-week strike by the Swaziland Plantation and Agricultural Workers Union (SAPWU) has ended with a settlement bringing workers a 10% wage increase and satisfying the union’s non-wage demands, including improved benefits for seasonal workers. Over the course of the strike involving some 3,000 workers, union members stood up to intimidation by military and security forces and legal action by the company intended to hamper picketing. Ubombo Sugar, the Swazi subsidiary of South African sugar giant Illovo, is 40% owned by Swaziland’s despotic monarch Mswati III. Illovo in turn is 51% controlled by the UK’s Associated British Foods (ABF). Reactions to the passing of Nelson Mandela – Mal Content.